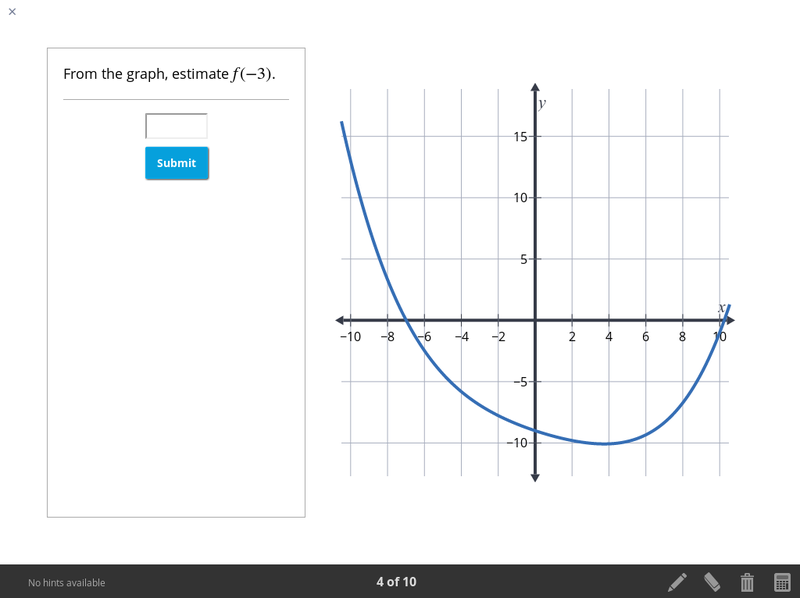 Today, we're excited to announce two of our most-anticipated features, review questions and automated suggestions for our online precalculus and calculus content. Give it a try, or sign up for an account to get started! 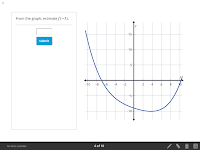 At any time, you can ask our system for a short quiz to test your newly-gained knowledge. 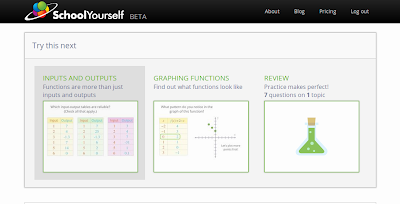 We will choose questions from our large (and still growing) database of review questions that are best-suited for you based on how you've interacted with other lessons and questions. 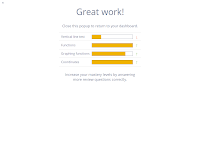 We'll make sure to choose questions on topics that you need to review the most, and at an appropriate level of difficulty. 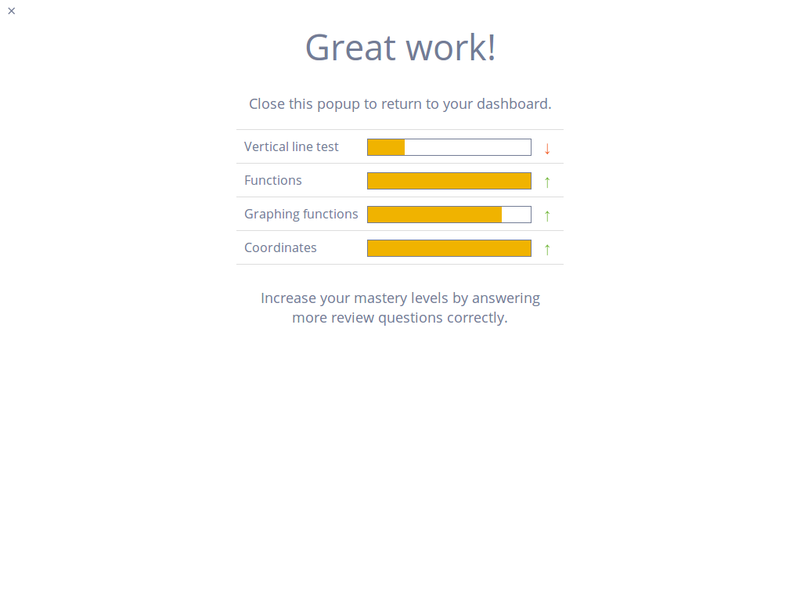 As you progress through the course, you'll be able to see which topics you excel at and which ones you struggle on. Our system notices these things too, and can automatically highlight lessons you ought to review if you are having trouble. With automated suggestions and review questions, there is now no need to have to browse through endless lists of videos or tables of contents just to find what you should look at next. 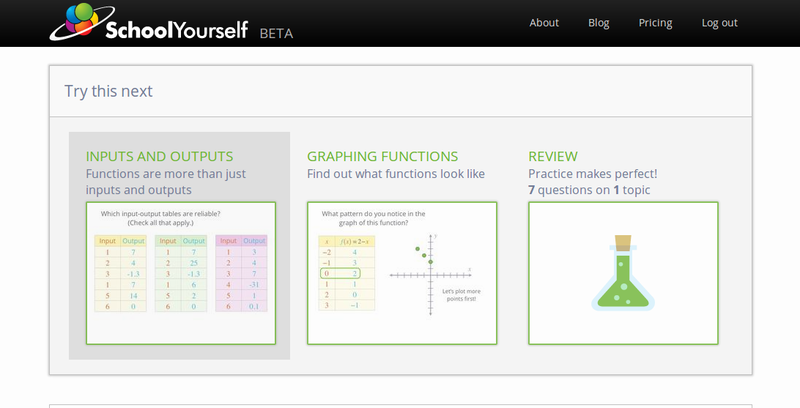 School Yourself can automatically find out what your weak points are and help you master them! How much could you expect to win from the Mega Millions lottery? In case you haven't heard, the Mega Millions lottery reached an astonishing $648 million this week. There were two winning tickets, but only one winner has come forward so far. 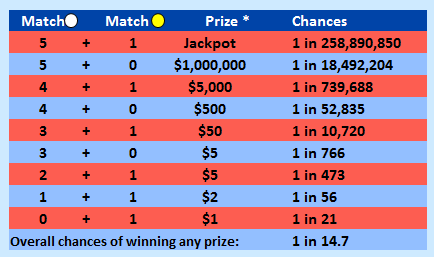 Here we'll look at the question of how much money you could expect to win from this lottery. In other words, for every dollar you spend playing the Mega Millions lottery, how much money could you expect to get back? If you invested $1.00 in the stock market a year ago, you would have $1.23 today. So for every dollar you invested, you would have made an additional 23 cents. If you play roulette at a casino, for every $1.00 you bet, you make, on average, $0.95 back. So for every dollar you bet, you would lose 5 cents. So it looks like investing in the stock market is a pretty good way to spend a dollar, while playing roulette will lose you some money. 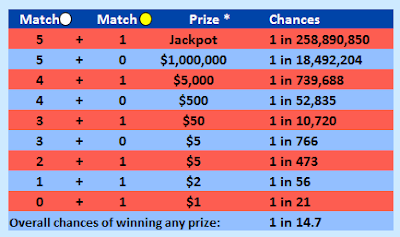 How does playing the lottery stack up? They advertise at the bottom that your chances of "winning any prize" are 1 in 14.7, or about 6.8%, which sounds pretty good. Unfortunately, just about all of that 6.8% is taken up by prizes of $5 or less. Anyway, let's figure this out: for every $1 you spend on the Mega Millions, how much could you expect to win? In other words, we want to find the expected value of your cash winnings. The expected value of the Mega Millions lottery without the jackpot is only about $0.18. But if we include a jackpot of $648 million, the calculation becomes a little more challenging, because that prize can be split if there's more than one winning ticket. As far as we know, the Mega Millions lottery doesn't publicly announce how many tickets are sold, but it's probably in the many hundreds of millions for big jackpots like this one. As more tickets get sold, it's more likely that there are multiple winners. Let's say enough tickets were sold so that we can expect (there's that word again) about 2 winners. With these numbers, you can expect to make $1.42 off of every dollar you put in the lottery. Those are better results than the stock market! Any time the lottery exceeds about $250,000,000, your expected winnings are greater than $1.00, so it seems like a good idea to play. But not so fast. While you're definitely spending a full dollar to play, your winnings are taxable. The government may not tax you much when you win $50 for matching a few numbers, but you can bet they'll tax your jackpot prize (or the $1 million prize for matching 6 numbers). Assuming a 40% tax rate, for every $1.00 you spend, you'll now make only about $0.90, meaning you'll lose 10 cents. And you actually lose at lot more (closer to 40 cents) if you decide to take your winnings all at once. The 10-cent loss is only if you let the lottery make smaller payouts to you over the course of 20 years (and they don't account for inflation). So to summarize, for every $1.00 you spent on Mega Millions, you could expect to lose about 40 cents. You're better off playing roulette. Bitcoin has the characteristics of money (durability, portability, fungibility, scarcity, divisibility, and recognizability) based on the properties of mathematics rather than relying on physical properties (like gold and silver) or trust in central authorities (like fiat currencies). In short, Bitcoin is backed by mathematics. So what is Bitcoin, anyway? Bitcoin is a relatively new currency (think dollars, euros, or yen), and was introduced by anonymous creators in 2009. First, how much is one bitcoin worth? As with all things: however much someone is willing to pay for it. 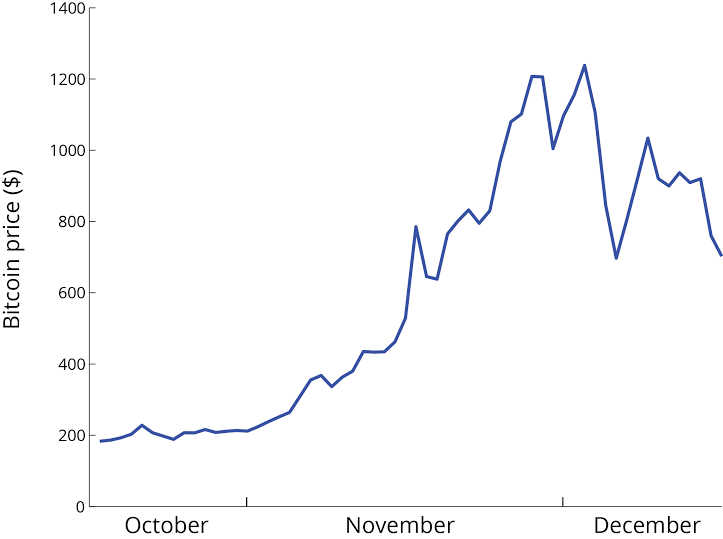 Here's a graph of how much people have been willing to pay for one bitcoin over the last few months. 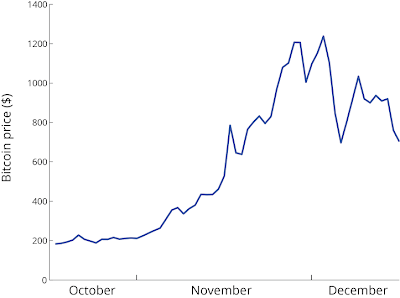 Bitcoin price has been fluctuating recently, and hit a maximum of over $1200 on December 4. Unlike other currencies, Bitcoin is digital. You can't hold a Bitcoin in your hand. So how do you know how many Bitcoins (or "BTCs") you have? Well, it's a matter of public record! Every time someone pays someone else in Bitcoin, the transaction gets logged in a digital ledger (essentially a list of every single transaction) known as the "block chain." So the list of who has how many BTCs is publicly available. But many Bitcoin addresses (long chains of numbers and letters) are anonymous -- everyone knows how many BTCs they have, but almost no one knows who owns the address. In addition to an address, each Bitcoin user also has a private key, which he/she needs when making Bitcoin payments. These keys are additional long chains of numbers and letters, but they are not publicly available. When Person A makes a payment to Person B in Bitcoin, the transaction gets added to the block chain. But how does Person B (and everyone else) know this is a real payment, as opposed to some fraud who's only pretending to be Person A (perhaps using their Bitcoin address)? Just like a bank verifies the authenticity of checks, Bitcoin transactions get verified as well, but mathematically. But given an output, it's really hard to find any input. The miners get paid for verifying transactions with -- you guessed it -- more Bitcoin! By verifying transactions, they're "mining" for Bitcoin, much like a 49er would mine for gold. But the rate at which miners are rewarded exponentially decays over time, so that the total number of BTCs in circulation is tightly controlled. So Bitcoin involves mathematics and cryptography rather than centralized institutions (like mints and banks) to create currency and prevent fraudulent transactions. Over the next few years, we'll see if digital currencies like Bitcoin catch on. What shape is the moon in the sky? So if a full moon looks like a circle, how would describe the shape of a crescent moon? 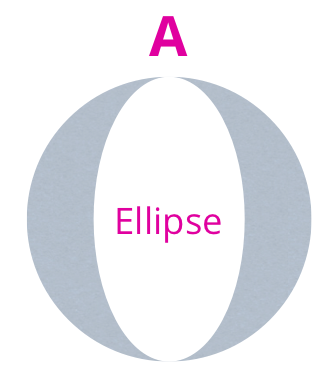 Sure, it's a "crescent," but let's try to be more specific. 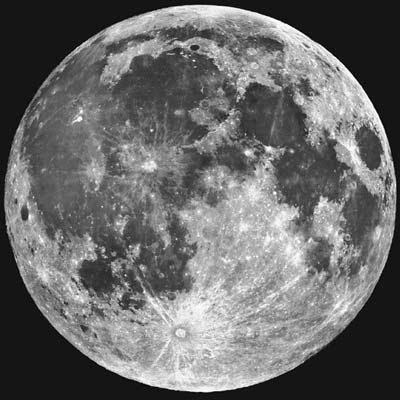 Throughout each month, the shape of the moon changes, but the shape actually follows a specific mathematical pattern. Here are sketches of three different "crescents," but only one of these is an accurate sketch of a crescent moon as it might appear in the sky. 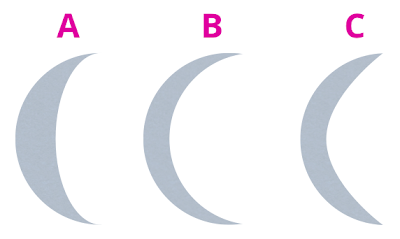 Which one of these do you think the moon could look like? Leave your vote in the comments below, and we'll reveal the correct answer in a later post! 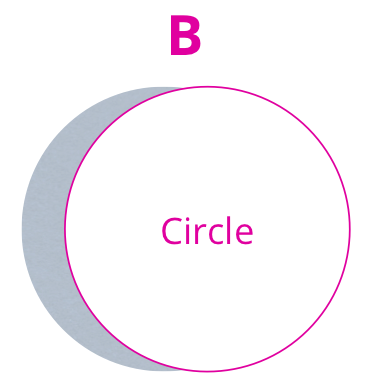 Here's a little more background on the three sketches: each one starts with a circle, and then part of the circle is removed. In each sketch, the shape of the removed piece is another conic section. 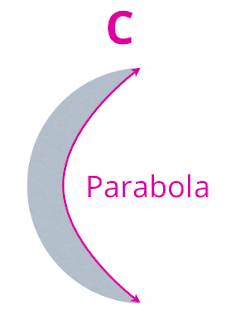 Conic sections are a group of mathematical functions including circles, ellipses, parabolas, and hyperbolas. In sketch C, a parabola was drawn inside the circle, and everything to the right of the parabola was removed. Does the moon look like this crescent?